A while back I got curious about how certain text effects could be achieved, and one of the things I explored was warping text along a curve to achieve a kind of sweeping effect. I created a prototype for this, to explore different solutions. This article contains some general notes on the subject, as I reflect back on this work. The information given here could be used as a kind of cookbook to replicate the work. The original work was done using C# and GDI+, although the concepts are applicable to other frameworks. Given some arbitrary spline, how can text be drawn in such a way that it appears to follow the curve in a way that is appealing to the eye? A sample of the desired result. Looking around the interwebbietubes, there seemed to be few examples of doing this, and most examples were crude, i.e. involving rotating individual letters with linear transforms to align each character with the curve, which results in a very odd, non-fluid appearance. Much good information was gleaned from old articles written by Don Lancaster, in particular one about Nonlinear Graphics Transforms from 1995. As always, it is good to keep in mind that in this field, we stand on the shoulders of giants. Many thanks to Don for putting so much good and accessible information out there over the years. Line: a line. includes the endpoint, the start point was the last point from the last instruction. There are just two that render something visible when a GraphicsPath is drawn: Line and Bézier. Note that the MSDN documentation mixes up quadratic and cubic Splines. (Imagine that! misleading MSDN docs. Grumble.) 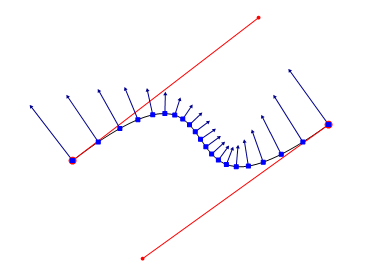 In practice, I've never run across a GraphicsPath that actually contains a quadratic spline (Bezier3). What about other shapes? After all, an ellipse can be added to a GraphicsPath, it must have an ellipse primitive, right? Nope. 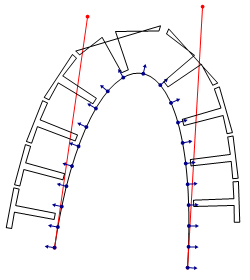 If an ellipse is added to a GraphicsPath, under the hood it will be approximated using several Bézier splines. What about adding text to a GraphicsPath? Once again, it reduces to a bunch of points and instructions for lines and cubic Béziers. These are derived directly from the description of the font, which is vector based as well. The nice thing is that if a bunch of things drawn into a GraphicsPath, one can iterate over these primitives and get a complete description of what it is doing under the hood. And with that information, an identical path can reconstructed from the primitives. During the process, the points can be pushed around using some kind of transform to achieve the text warping effect. Text added to a GraphicsPath then rendered without fill. For my first pass at this, I decided to use a Bézier spline to define the path of the text. Cubic Béziers are supported by GDI+, there are methods for drawing them on the Graphics object, and they are one of the few primitives supported by GraphicsPath. The formulas for Béziers are simple to calculate, they can be used to approximate other curves, and getting a set of points along a cubic Bézier given its four control points is mostly a trivial exercise. More complex shapes/curves would come later. Getting a point on a Bézier curve is not something that GDI+ provides for, so understanding the formulas for cubic Béziers is necessary for this work. I won't go into exhaustive detail on the math behind this, as plenty of information is readily available on this subject, from Wikipedia and elsewhere. OK, math time! It is most illustrative to look at how a cubic Bézier is constructed geometrically, which is pictured below. 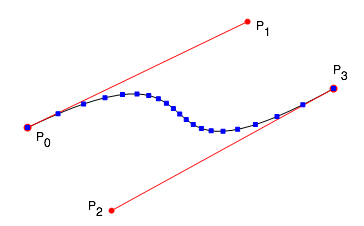 The curve is defined by four control points P0 through P3. The first and last point are the start and end point of the curve, the other two are colloquially referred to as "handles" to control the shape of the curve. The four control points can be connected to form three line segments (pictured in gray). Three points are interpolated using the parameter t on the line segments connecting the control points, and these form the two green segments above. A final line segment is constructed by interpolating points along the previous two segments for t in the same way (shown in blue). A final point is interpolated along this last line segment, and that point is a point on the curve for value t.
Where P9 is the point on the curve for t.
For values of t between 0 to 1, these polynomials produce the x and y coordinates for a point on the curve. Values outside of that range continue the function out to infinity somewhere. The formula is really the same for the x and y versions, just with different coefficients. The equations independently relate x and y to the value parametric value t. Because of this splines can be extended into three dimensions (or more!) very easily. So where do those coefficients (A..H) come from? For a full explanation of the math, check the resources section at the bottom, but for now I'll just give the formulas for converting control points to coefficients. // call function that draws a filled rect at x,y coord. Pseudocode output. GDI+ spline is in black. Control points are connected with red lines. The 20 points calculated are marked in blue. As t varies from 0 to 1, these points "travel" along the curve from the start point to the end point. 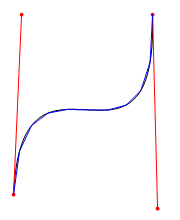 If enough values are used, a good approximation of the Bézier could be drawn. In fact, under the hood, most graphics systems draw Bézier curves using recursive subdivision, dividing the curve to the level of pixels or sufficiently small enough to draw with short line segments. One other interesting thing to note is that even though the values for t used varied by a fixed increment, some of the resulting points are closer together than others, depending on where they lie on the curve. 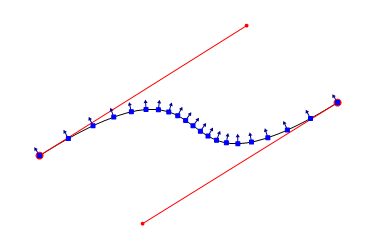 Any two sequential points may have different "arc-lengths" (distance measured along the curve, rather than straight-line distance) from another two. It may help to think of it as the rate at which the output values move along the curve "speeds up" and "slows down" even though the change in t is constant. We'll revisit to this later. The Y coordinates for the text need to project out away from the curve in a direction perpendicular to the curve at that point. In order to do that, a vector is needed that is perpendicular to the curve for the point produced by t. That can be obtained by finding the tangent for the curve at that point, and rotating it 90 degrees. Raw Perpendicular vectors. These have been shortened for illustrative purposes. Normalized perpendicular vectors, for 20 points defined by parameter t.
Vectors drawn with lines 10 pixels long for illustrative purposes. That covers most of the math needed to make a first pass at warping text onto a Bézier curve. // with a domain between 0 and 1. // with y. it becomes the new magnitude of the vector. // to create a new path. arc-length parameterized, and the problem this creates. As the parameter t varies by a fixed amount, the output points have varying arc-lengths from one to the next. This characteristic of the Bézier formula is what causes the text to be compressed or stretched along the curve. What would be better is to map the text's x coordinate to the parameter t in such a way that the text does not try to exactly fit the text to the full length of the Bézier. In order to do that, the arc-length of the curve must be known. This problem is related to the first one. (shown at top in blue) is used for text, and scaled to the domain of 0..1. 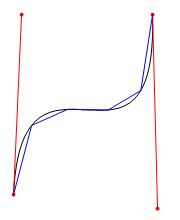 Bounding box is shown as it would look if it were somehow wrapped to the curve. 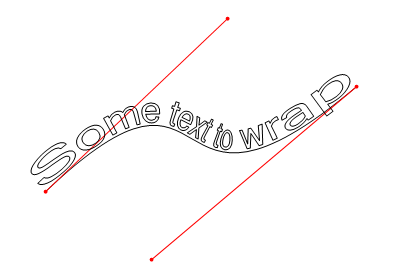 The text can also be clipped to the bounding box to prevent it from overrunning the end of the spline. That leaves the problem of calculating the arc-length of a cubic Bézier curve. After doing some research, I discovered that there is apparently no closed form solution to this problem. There are a number of ways of approximating the arc-length, some involving moderately complex calculus. Even the most sophisticated and accurate solutions involve an iterative approach. (See resources for more info). However, there is a very simple way to estimate the arc-length: divide the curve into a bunch of line segments based on a fixed increment for t, then sum the straight-line length of those line segments. It turns out that even a small number of divisions can give a fairly good estimate, as it exploits a characteristic of the Bézier formula that the output points are close together in sharp curves. Some empirical investigation showed that around 100 divisions would yield estimates with less than .001 error, which would be half a pixel for a 500 pixel long curve. Close enough for the purpose at hand. Estimating arc-length with four divisions. segments shown in blue have large error. on the curve, estimation error is smaller. The pseudocode for this is very simple. There are a few optimizations that can be made, but the basic algorithm is fairly efficient as long as the number of divisions is not too large. // have the Bézier coefficients to calculate this. This code could easily be generalized for any single-valued parameterized algorithm that is continuous, has a fixed domain, and returns points, such as the formula for an ellipse or different types of splines. It may be possible to estimate the error and dynamically pick an "ideal" number of divisions. This could be done by subdividing until segment lengths are below some threshold or by comparing the tangents of the line segments to the tangents of the curve, but I have not explored either of these ideas. Fixing the number of divisions at around 100 seems to work well enough for the purpose at hand. 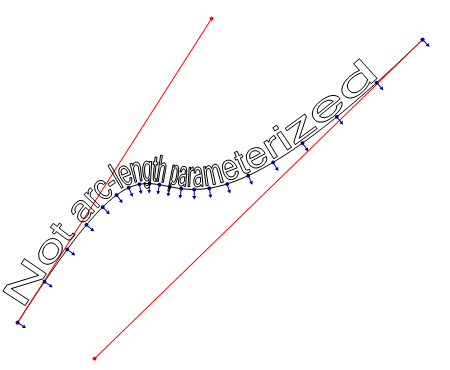 Even after the text width problem is fixed, there is still an issue with text getting squashed or stretched due to the non-uniform arc-lengths between uniform values of t.
This graphic illustrates that the lack of arc-length parameterization. This issue is independent of the other problem, but has a related solution. The solution to this problem is called arc-length parameterization. The idea is to map an input value u to a value t which can be passed to the Bézier formula, and will produce points that have uniform arc-length distances for uniform values of u. Stated another way, for values 0..1 for u it would map to values of t in such a way to produce a point that is a fractional arc-length distance from the start of the curve equal to u. For example, a value of .25 for u would always produce a point that is one-fourth of the arc-length distance along the curve. The intermediate value of t in this case is unknown, and must be calculated by the mapping function somehow. Given such a table, it is possible to find values of t that are close to a desired arc-length. So we could take and input value of u, calculate the desired arcLength (u * totalArcLength), then find the index of the largest entry in the table that is smaller than or equal to the desired arcLength. This could be done using a brute force traversal, or preferably, a binary search. If this value happens to be equal to the arcLength, then the value of t for the input value of u can be calculated as previously described. More often then not, the search will find the largest value that is smaller than the desired arc-length. In this case, linear interpolation can be used between the found entry and the next one to find an estimate for t. Assuming sufficient divisions were used to create the table, the distance between those to points will be sufficiently small that the error for the mapping will be negligible. // determine where we are between the 'before' and 'after' points. for u (plotted in blue) are now evenly distributed on the curve. The algorithms presented still may have some minor issues. 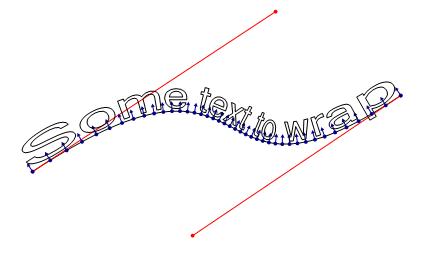 In particular, long horizontal line segments may cause the characters to distort when going around a sharp curve. This problem can be overcome in all but the most severe cases by iterating through the text path and dividing long line segments into shorter ones. at some expense to performance. In some cases, this technique can benefit from using short Bézier curves instead of short line segments. However, it is not enough to simply replace all line segments with Bézier curves, as this gives a different and sometimes unpleasant appearance for long segments. It is left as an exercise to the reader to find out why. The techniques can easily be expanded to allow for warping to arbitrary paths of increasing complexity. All that need be done is calculate the arc-length of the entire path (by summing the arc-lengths of its components), and then parameterize the whole thing. A wrapper class for the formula can be written which contains multiple sub-paths as children, and could decide which child to use for a particular parameter through reverse interpolation over the total length. Alternatively this could be built into the arc-length estimation algorithm. One could even wrap text around other text! Wrapping text around an arbitrary path. This potentially introduces new problems to solve, particularly for warping around other text paths. Discontinuities (places where the path stops at one place and restarts elsewhere), can cause severe 'garbling' if a character or other object straddles those points. A good general algorithm would need to account for these, and make sure that they are handled appropriately, perhaps by pushing the characters beyond the break. Also, many characters contain acute bends and corners that may result in excessive warping that looks unpleasant (as seen in a few places in the figure above). 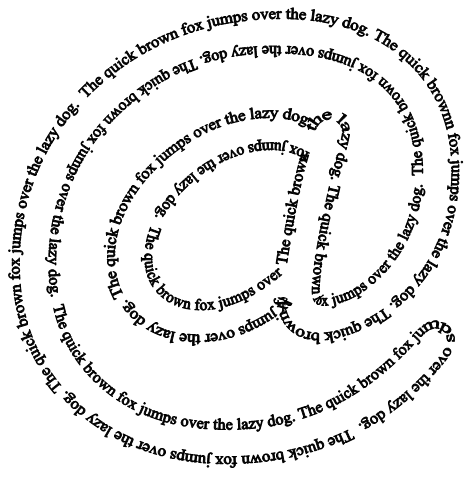 The use of these techniques for distorting text (or any path!) can give a fairly natural and fluid appearance. The algorithms presented allow for real time manipulation of the curves, even on low-end modern hardware. Several optimizations can be made that were not covered in this article for the sake of simplicity. The techniques can be readily adapted to any graphics framework that has a vector path object (such as WPF, Cocoa, Postscript, etc). Subtle use of warped vector paths can be used for fun aesthetic effects. To find out where do those coefficients come from, specifically read this article.